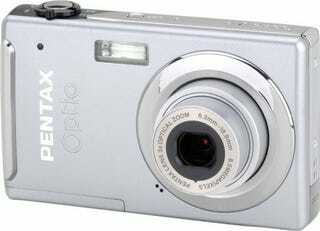 The other Pentax launched today is this 8MP slim that is about 2cm thick. Not bad, but a quick Google search shows that Sony's had thinner Cybershots, even if at lower MP ratings. (Not sure if that's counting the big lens cover slides that most T series cams have.) The back has a 3-inch LCD. Dimensions (W x H x D): 3.8 x 2.3 x 0.7"